Winspear was in business as a manufacturer and retailer of microscopes for only about ten years, and his instruments are relatively rare. Those that survive exhibit some unique, creative features. These may reflect his location in Hull, Yorkshire, far from the major English centers of microscope construction. Those characteristics indicate that Winspear probably made all of his microscopes in house, rather than buying instruments from wholesale manufacturers. 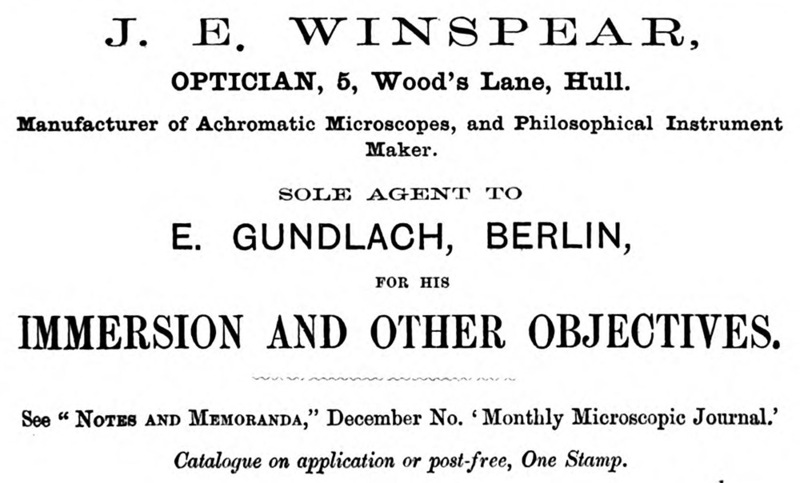 Additionally, for a few years, Winspear was England’s sole importer of the microscope objective lenses made by Ernst Gundlach (1834–1908). This would have brought him considerable business, as the lenses were held in very high regard. For example, an 1869 report to the Royal Microscopical Society stated, “a young optician named Gundlach, of Berlin, has succeeded in making object-glasses, which are cheaper and more powerful than those of Hartnack and other opticians. His No. 7 is better than Hartnack's No. 9 or No. 10, at less than half the price of the No. 9. It has higher magnifying power, more light, and greater focal distance. … Gundlach's No. 8 is better than Hartnack's No. 14, and is only a third of the price”. The following year, “Mr. Slack called the attention of the meeting to a series of microscopic objectives made by Herr Gundlach, of Berlin, whose agent in England was Mr. Winspear, of Hull. The Gundlach objectives were remarkable for combining a very considerable amount of merit with unusually low price. The lower powers, 2-inch, 1-inch, 1 1/2-inch, were sold by Mr. Winspear at 17s., and 1/12th and 1/16th immersion lenses at 3£ 12s. 6d, including the Society's standard screw and brass boxes”. By the end of 1871, Gundlach’s lenses were also distributed in England by Charles Baker of London. This was undoubtedly a good business move for Gundlach, as it placed him directly into the largest market in England, but it likely hurt Winspear’s finances. Adding to that, Gundlach emigrated from Germany to the United States during the early 1870s, which completely eliminated that source of income. Winspear continued making microscopes, surveying equipment, and other instruments for a few years, but had to file for bankruptcy in 1877. Winspear never again worked as a manufacturer of optical instruments. Figure 1. An example of J.E. Winspear’s “Educational” microscope. Serial number 122, manufactured circa 1870. The inset engraving and text are from Winspear’s 1872 catalogue. The microscope has a simple draw-tube focus, without a fine-focusing mechanism. Nonetheless, it features complex features such as a mirror that can adjust to any angle below the stage, as well as rising above the stage for top illumination of opaque objects. The aperture in the stage is threaded to accept a substage, which is not present in this example, nor was it included as a rule. The lens is not marked, but is of high quality and strongly resembles those of Ernst Gundlach. Figure 2. Winspear binocular microscope serial number 137, which once belonged to musical composer Edward Elgar (1857-1934). Adapted for nonprofit, educational purposes from Impey, 1972. Figure 3. 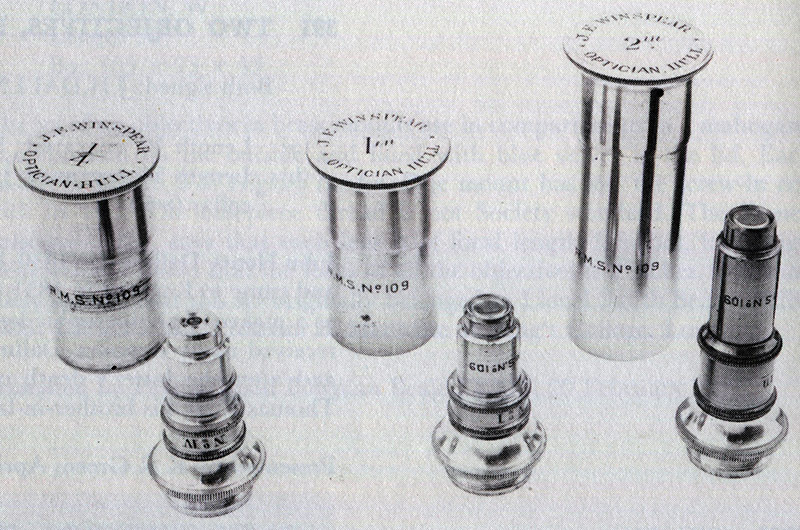 Three unsigned objective lenses that resemble those made by Gundlach, with canisters labeled “J.E. Winspear, Optician, Hull”. They are in the collection of the Royal Microscopical Society, and were purchased from Winspear on May 19, 1870, for 2£ 17s 6d. Adapted for nonprofit, educational purposes from Turner, 1989. John Winspear was born during the spring of 1844 in York, Yorkshire. He was the elder of two children, a sister being born in 1846. John’s father, Emanuel, was recorded as having been a “shopkeeper” and “flour dealer”. Emanuel appears to have been fairly affluent; he died during the 1850s, and his widow was described in the 1861 census as a “fund holder”, i.e., someone living on income from investments. John learned optical work as a teenager. The 1861 census lists the 16 year-old as being an “optician’s assistant” in York, living with his mother, sister, and a lodger. By 1862, when he was 22 years old, Winspear was a “working optician” in Bradford, Yorkshire. His shop was located at 1 Sunbridge Road. Winspear moved to Hull, Yorkshire, by 1870, with a shop at 5 Wood’s Lane (Figure 4). He described himself as a “manufacturer of achromatic microscopes and philosophical instruments”. 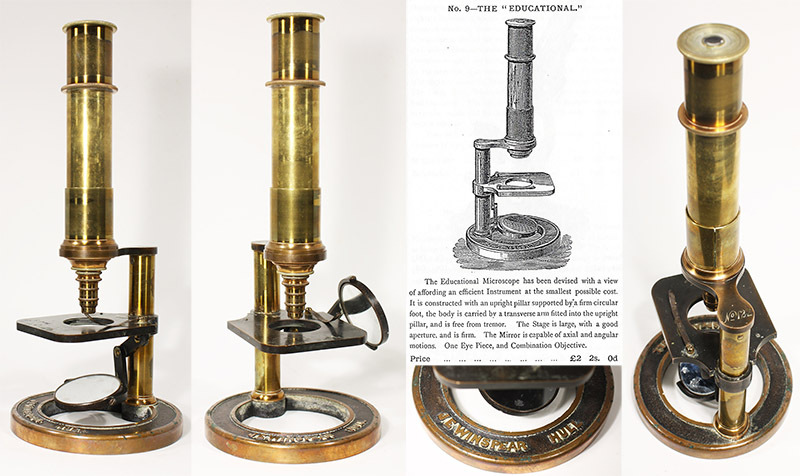 In 1870, the Royal Microscopical Society was shown “a good form of student's microscope with rotating stage by Mr. Winspear”. This may have resembled the instrument illustrated above in Figure 1, although the stage was clearly of a very different form. He also advertised to be “sole agent” of Gundlach’s lenses (Figure 4). While undoubtedly a boon to Winspear’s business, this was not optimal for Gundlach. In 1870, the editors of Scientific Opinion responded to a reader’s inquiry with, “Gundlach's English agent is Mr. Winspear, optician, Hull. If (the correspondent) will communicate with him the matter can be arranged. We believe it takes some weeks to procure a glass. Crouch, of London, is now making an excellent series of English cheap immersion object-glasses”. Thus, not only did Gundlach’s lenses have to be shipped from Berlin to Yorkshire before reaching the English marketplace, but reasonably equal lenses could be obtained directly from a London manufacturer. Winspear’s exclusive deal with Gundlach was over by the end of 1871, as evidenced by a December 22, 1871 report from the Royal Microscopical Society of a display of “a series of cheap lenses by Gundlach, very kindly lent… by Mr. T. Curties, of the establishment of C. Baker, 244, High Holborn, the agent for England”. Despite that setback, Winspear’s business progressed for a few years. In 1871, he and H.D. Hoskold invented and patented a new form of surveying transit, and exhibited it at that year’s London International Exposition. A second edition of Winspear’s catalogue was issued in 1872. His address was given in the catalogue as “Derringham Works”. A Hull trade directory further identified the location as 44 Derringham Street, off Spring Bank. The town’s burgher’s rolls also describe a “workshop” at 15 Brunswick Terrace, off Grosvenor Street. 1872 also brought the announcement of a “new series of microscopic objectives” from Winspear (Figure 5). Being a trained optical worker, he probably made these himself. Winspear was elected as a Fellow of the Royal Microscopical Society on June 5, 1872. That year, Winspear produced a custom-designed instrument for the well-known microscopist Henry Pocklington, who described it as, “The use of strong acids is attended with some risk of injury to the front lens of the objective, and also to the brasswork of the stand or stage. To obviate these risks, Mr. J. E. Winspear, of Derringham Street, Hull, has devised, at my suggestion, a ‘medical’ microscope, in which the ‘limb’ carrying the ‘body’ is made to fall back, and the lenses thus removed from the fumes of the acids until they are actually required for observing the effect produced. The stage plate in this instrument is of glass”. Pocklington further wrote, “There are so many makers whose instruments answer the requirements of students, and are sold within the limits we have given, that we hesitate to particularize any; but in common justice I am bound to say that I have received from Messrs. Swift, of London, and Winspear, of Hull, the utmost courtesy and assistance in my many microscopical emergencies. The latter maker has especially been always ready to carry into effect any economical dodge to which fancy or the force of circumstances may have impelled me, and his Student strikes me as being so pre-eminently a student’s instrument, that it affords me much pleasure to mention it in this place”. As a side business, possibly to counteract the loss of trade in Gundlach’s lenses, Winspear established a “beer house”. He appears to have been optimistic of his future. John married Hannah Eliza Coates during the summer of 1876. Their first child, Edith, was born a year later. Winspear’s optical business evidently declined, and his liquidation proceedings were initiated in May, 1877. The bankruptcy was finalized in 1879. The 1881 census saw Winspear, his wife, and three children living in Newington, York. John was then working as a “photographer”. By 1890, they had moved to Gateshead, Durham, with John working as a “confectioner”. The 1891 census listed him as an employer, indicated that he owned the candy shop. That evidently did not last, as the 1901 census listed Winspear as a “baker’s shopkeeper” and a “worker”. He passed way on May 28, 1906, in Gateshead. Figure 5. An 1872 advertisement, from ‘Hardwicke’s Science-Gossip’. Figure 6. An 1873 advertisement, from ‘Hardwicke’s Science-Gossip’. My thanks to Joe Zeligs for sharing helpful information on Winspear’s microscope business.